Jun 15, 2018 | What's happened? 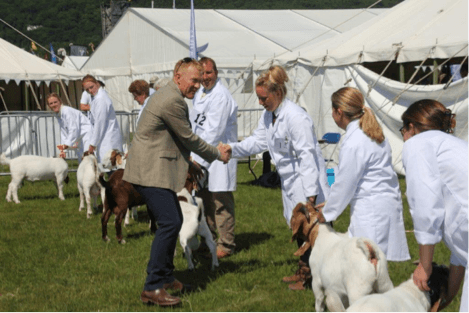 The British Boer Goat Society invited leading South African Boer Goat Judge Callie Wannenburg to judge at one of the leading Agricultural Shows in Europe. The beautiful Malvern Hills offer a unique backdrop to the showground, making Royal Three Counties one of the most attractive showgrounds in the country. This is a long established (1797) agricultural society promoting agriculture, horticulture and arboriculture in the UK. Her Royal Highness, The Princess Royal (Princess Anne) is patron of The Royal Three Counties Show and the events attract a footfall of 250,000 people per year. Boer goat classes were held over Saturday and Sunday and spectator numbers were high. Callie Wannenburg’s clear and concise explanations of what he was looking for in each class and his reasoning behind his placings was fascinating and most appreciated by the knowledgeable spectators. The standard of boer goats was second to none and each exhibitor who won a hard earned rosette would have been very proud to feature in the results. In 2018 the BBGS needed a bigger marquee to house the extra numbers of goats forward. The BBGS was very grateful to Robin Metcalf of ‘For Farmers’ for his generous sponsorship which supported this. The show was a huge success for every breeder of Boer Goats, not just those exhibiting, as it was a real showcase for the Breed. The footfall through the Marquee on all 3 days was tremendous. The BBGS was lucky that both Callie Wannenburg and Ian Johnson gave Boer Goat talks on both Saturday and Sunday within the Marquee and answered many queries from the public. This is definitely a not to be missed event whether as an exhibitor or spectator.